My love for rose gold has grown over the past few years, and it shows with my new addition from The Peach Box. I'm not sure if the fact that it's called the 'Empress bracelet,' or the crisp Roman numerals that got me, but it got me. Now just to add some more to my basket to go with the rose-gold Marc by Marc Jacobs watch I've been planning on getting for a while (I think this is the week, it will happen). I feel a little all over the place today... I got up at 5am fuelled by fangirl-level dedication with Mum to squeal over Guy Sebastian as Australia's entry into the Eurovision Grand Finals, so I'm a little exhausted and dazed now. Was it worth it? YES IT WAS. I'm so proud, and once the performance squealing was over, I proceeded to fangirl every time someone gave us 12 points (THANK YOU SWEDEN & AUSTRIA). I feel the need to live-tweet the event every year, but a few favourites I re-tweeted this year about Australia were x, x and x. What a fantastic achievement in placing fifth as a non-European country. Did you watch Eurovision? Who was your favourite? Hint: the answer is Australia/Guy Sebastian. What an awesome choice of bag! Love it so much! I so want one of these coats! I did watch most of Eurovision but unfortunately my favourite wasn't Guy Sebastian. My favourite was the Italian trio Il Volo. They definitely should have won! 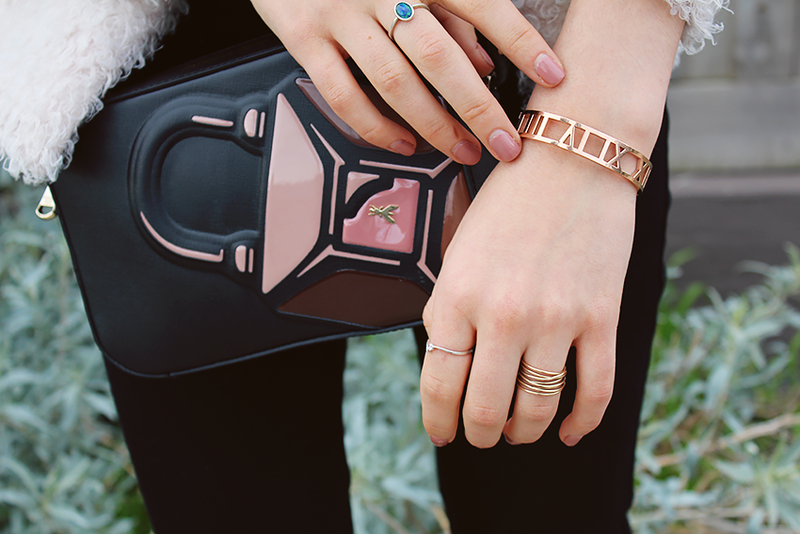 Love all the details in your outfit that I can't even decide which is my favorite piece! SOO in love with this outfit. That fuzzy sweater is seriously everything and adoring your rose gold bracelet. So chic! This outfit is gorgeous on you! I really love how you've styled the look. I love your blog! Uber warm too - just wish it had longer sleeves sometimes haha. $5 FROM H&M ON SALE. WHAT. No deciding is needed ;-) Thanks beautiful girl!!! So sorry it's taken me a while to respond!!! We don't have Claire's or Barry M! Hmm... something I definitely wish we had though is a TJ/TK Maxx - I've seen so many people post beautiful homewares from there that I need in my life haha.